February 2009 - Hairlicious Inc.
Repeat steps 3-4 for the other side. Apply t-shirt on hair to dry. Promises: Ultra Black Hair Lotion Creme Moisturizer contains just the right amount of essential oil needed to penetrate and soften our dry hair type. Use it for natural,pressed or chemically processed hair, for course thick tresses, on wet hair or for daily maintainence to replace lost moisture. Great after a protein treatment when you need those extra oils to soften and smooth hard hair. This wonderful penetrating formula leave your hair feeling smooth, soft and non-greasy. Directions: For daily maintenance pour Lotion crème moisturizer in your palm and rub your palms together. Starting with the ends, smooth on the hair. Since the ends need more apply most of the product there, smoothing from the top of the head down to the ends what is left on your hands after the ends. Apply before or after styling and as often as needed. The amount you apply depends on your needs. Use modest amounts if your hair is slightly dry and generous amounts for excessively dry hair. After a protein treatment apply larger amounts on the hair as described for daily maintenance immediately after the treatment and as often as needed to soften the hair. 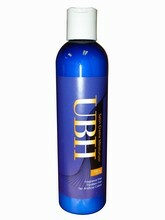 Can also be used to soften the hair after a UBH deep condition. For best results keep it off the scalp. Ingredients: Purified Water, Olive Oil, 1-Octadecanol, Cetrimonium Bromide, dl-Panthenol, Allantoin, Lecithin, Dimethicone Copolyol, Methylparaben, Diazolidinyl Urea, Propylparaben, Retinol, Tocopherol. The Truth: To be honest, this moisturizer didn't impress me much. I really tried to like it, but for some reason it never really penetrated or moisturized my hair. I tried it on freshly relaxed hair, but my hair started to clump together over time. I guess it's because it's so thick. Sometimes I would notice tiny broken hairs while applying it on my hair because of the thickness of the lotion. It also leaves behind a white residue when I rub it in. I tried it on air dried hair, but my hair was never really moisturized. On the plus side, this moisturizer worked very well on wet hair, it was very smooth and soft. Overall, I discovered that oil based moisturizers don't work well on my hair. I will not be repurchasing. Let's Chat: Your Relationship with Protein! Let's face it, many of us are scared of protein! We feel that protein in the "enemy", we will get "protein overload", it will cause more breakage, its bad for you etc. etc. The truth is, protein is great for our hair, especially if you have relaxed hair. Relaxed hair, as opposed to natural hair, needs a proper balance of both moisture and protein in order to maintain good health. Protein gives our hair body and thickness, while moisture gives our hair elasticity and softness. Remember, when we get relaxers, the protein content in our hair is almost completely stripped away !!! The chemicals in relaxers relaxes the curls simultaneously making the hair more weak and fragile. That's why it's highly recommend that we do a protein treatment before and after a relaxer to replenish and strengthen the protein loss we just encountered during the relaxing process. Believe it or not, you can use a light protein treatment in your regimen once a week or biweekly without going into protein overload, if you use a moisturizing treatment afterward. Rule of thumb: Always backup your protein with a moisturizing conditioner to return softness and moisture back into the hair. How do you feel about protein in your regimen? Are you scared of it too? Or do you welcome it with open arms? I purchased my JBCO (Jamaican Black Castor Oil) today at my local Beauty Supply Store, I decided to start a Castor Oil Challenge on Hairlista.com for fun. I'm excited and ready to begin!! The challenge begins Feb 7th 2009 until April 7th 2009. Right now, I'm all about increasing growth and thickness so that I can reach my goals a lot faster. If your interested, please join me! !